Graceland is so much more than a Mansion. It was the private retreat of The King of Rock 'n Roll. It was where his family grew up, spent their time together and enjoyed life. Today, you're invited to Explore Elvis Presley’s home and immerse yourself in his life and legacy. In addition to the Mansion, Graceland offers several exhibits that feature honors, accolades, personal items, and historical exhibits that pay tribute to Elvis and his legacy. A trip to Graceland is to experience the life of Elvis, celebrate his achievements, and witness the glory of all things The King. Learn more about all of the amazing Elvis museum experiences below; then, check out our great tour options. Explore the personal side of Elvis Presley with an interactive iPad tour of Graceland Mansion, hosted by John Stamos and featuring commentary and stories by Elvis and his daughter, Lisa Marie. 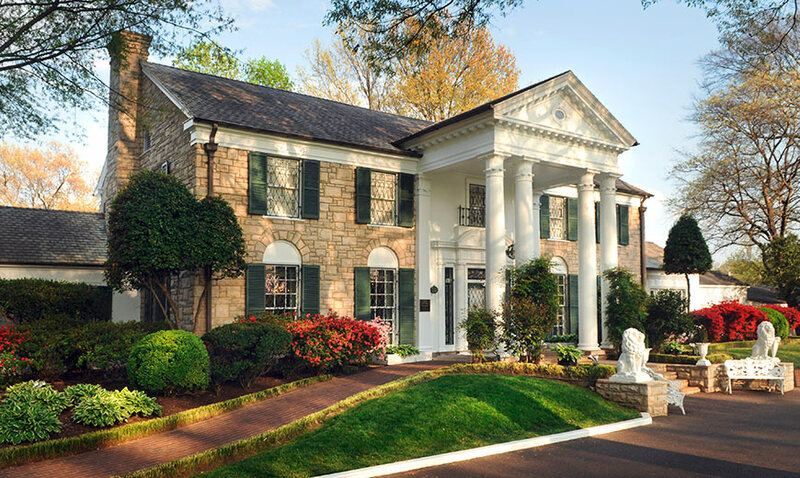 The tour of Graceland Mansion includes the living room, his parents’ bedroom, the kitchen, TV room, pool room, the famous Jungle Room, his father’s office, the newly-enhanced Trophy Building, the Racquetball Building – newly-restored to how it looked in 1977, and Meditation Garden. 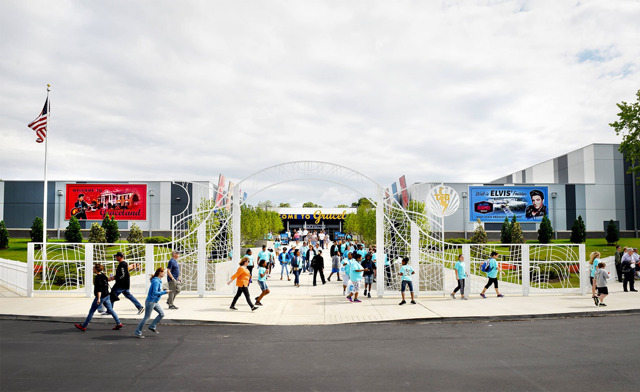 A state-of-the-art entertainment and exhibit complex over 200,000-square-feet in size, “Elvis Presley’s Memphis” enables you to follow the life path that Elvis took, surround yourself with the things that he loved, and experience the sights and sounds of the city that inspired him. Experience Elvis’ life and career like never before – his roots, his influences, and his artistry. Immerse yourself in Elvis’ incredible career through hundreds of artifacts and photos from significant events in his life, as you tour the extensive Graceland Archives, including Elvis’ amazing collection of gold and platinum records, his stunning jumpsuits, and other clothing, memorabilia from his movies, and more! Walk among some of Elvis’ favorite automobiles, including his iconic Pink Cadillac, Stutz Blackhawk, 1956 Cadillac Eldorado, Dino Ferrari, Mercedes Benz limousine, Rolls Royce sedans and more. Step aboard Elvis’ customized airplanes to see how he traveled in luxury. The Lisa Marie includes a living room, conference room, private bedroom and features gold-plated seatbelts, leather-covered tables, and 24-karat gold-flecked sinks. Plus, you can take a glimpse at Elvis’ smaller Lockheed Jetstar, the Hound Dog II. Ready to plan your Graceland experience? Aside from the incredible exhibitions, Elvis Presley’s Memphis offers unique dining experiences that showcase not only the flavors of Memphis but some of Elvis’ southern favorites as well. Authentic Memphis BBQ fare, including pork ribs, beef brisket and chicken, with our exclusive Vernon’s Smokehouse BBQ Sauce. In addition, enjoy the classic southern cuisine and Elvis’ favorite home cooking, including meatloaf, catfish and BBQ spaghetti. Classic American cuisine, for diners of every age, including great burgers, hot dogs and pizza – plus one of Elvis’ favorites - Peanut Butter and Banana Sandwiches. Be sure to also visit the Shake and Ice Cream station featuring hand-dipped ice cream, Root Beer floats and more! At Graceland, you will find the largest collection of Elvis merchandise in the world - everything from collectibles to apparel, accessories, jewelry, music, guitars, jumpsuits and more. 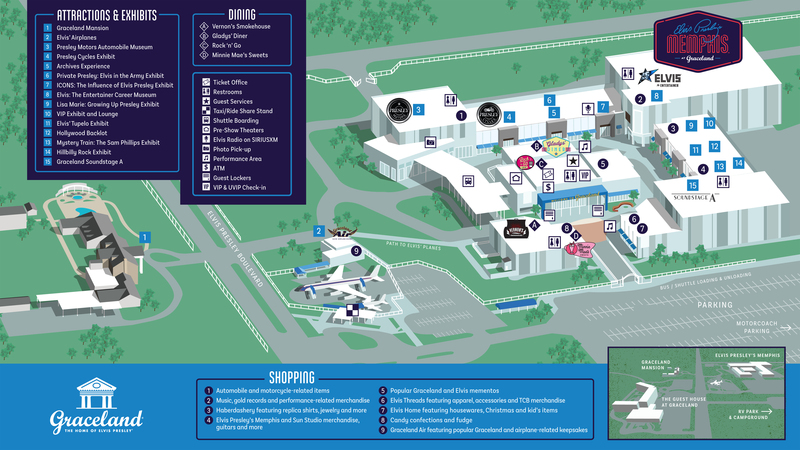 Shops are located throughout the Elvis Presley’s Memphis complex and each store features its own unique merchandise that you can purchase to commemorate your Graceland adventure. Located just a few steps from the gates of Graceland Mansion and recently awarded AAA’s Four Diamond Award, [The Guest House at Graceland] is inspired by the same warm Southern hospitality that Elvis Presley always showed his guests. 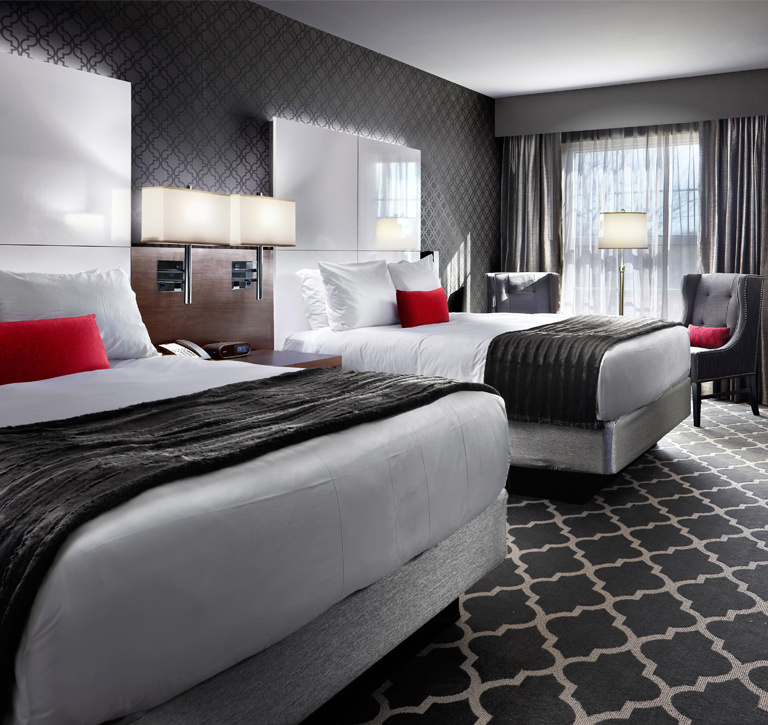 Recognized as one of the top hotels in Memphis, every aspect of this new hotel reflects Elvis’ personal style and the unique character of Graceland. Enjoy royal treatment from the helpful staff and world-class amenities that would make the King of Rock ‘n’ Roll proud. It is the perfect place to stay when enjoying Graceland and everything that Memphis has to offer.